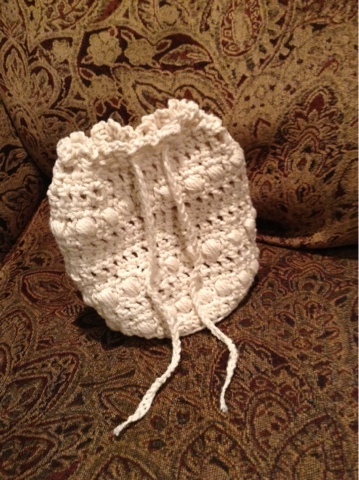 Special Stitch: Puff Stitch: yarn over and pull through leaving loops on the hook, repeat four more times. You should have 11 loops on your hook. 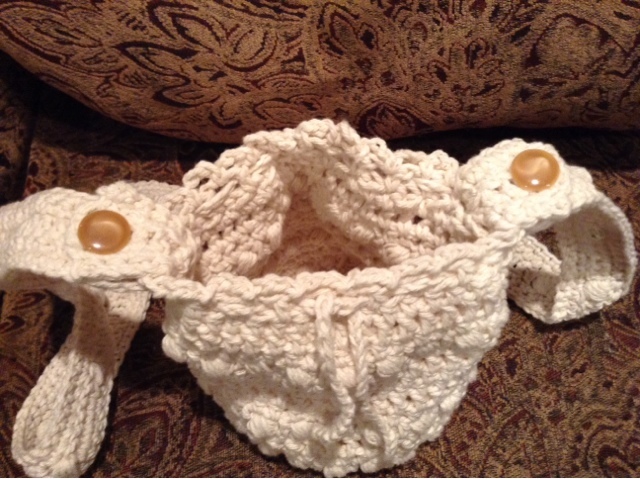 Yarn over pull through all loops. Row 2: 1 hdc in first stitch space, 2 in next. Repeat around. Join. Ch 2. Row 3: 1 hdc in first 2 stitch spaces, 2 in next. Repeat around. Join. ch 2. Row 4: 1 hdc in first 3 stitches, 2 in next. Repeat around. Join. ch 2. Row 5: hdc around in back loop only. Join, ch 2. Row 7: hdc in first stitch space, puff stitch in next. Repeat around. Join ch 2. Row 10: hdc in each stitch space around. Join. ch 2. Row 11: hdc in first stitch space, puff stitch in next. Repeat around. Join ch 2. Row 14-15 hdc in each stitch space around. Join. ch 2. Row 17: hdc in each stitch space around. Join. ch 2. Row 18: hdc in first stitch space, puff stitch in next. Repeat around. Join ch 2. Row 21: hdc in each stitch space around. Join. ch 2. Row 23: slip stitch into first chain space, ch 3, slip stitch into next chain space. Repeat around. Tie off and weave in ends. Tightly chain a cord long enough to string through the spaces in Row 22, and give a desired amount extra for tying. Row 1: sc in the backpost of your chain across. Ch 1 and turn. Row 2: sc in each stitch across. Ch 2 and turn. Row 3: dc in first 6 stitches, puff stitch in next. Repeat across 24 times. Dc in the next6 stitches. Ch 2 and turn. Row 4: sc in each stitch across. Ch 2 and turn. Row 5: sc in each stitch across. 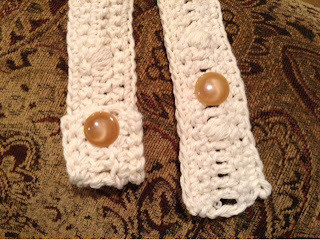 Tie off and weave in ends. Attach buttons on the back side of the strap. 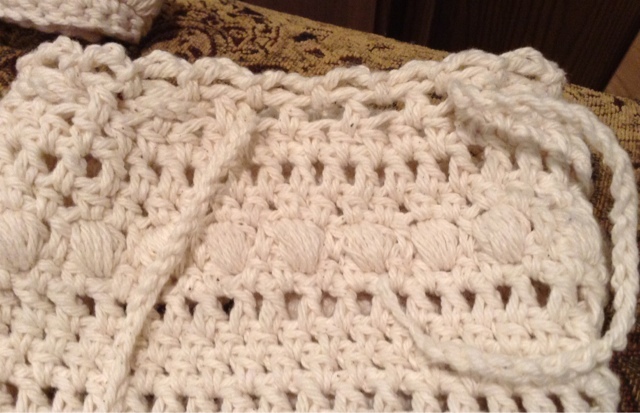 Placement is on the third dc above the first puff stitch on each end. 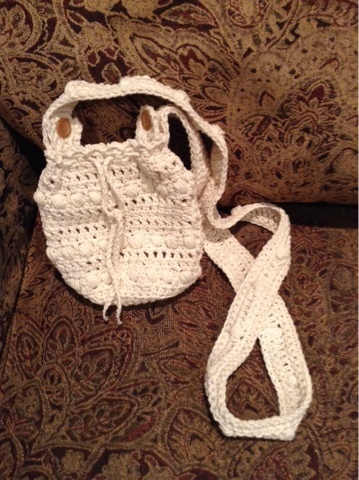 To attach shoulder strap, fold end of strap over lengthwise and slip through a space in Row 22. About 1/q4 of the way around from where you have your tie. Button it by slipping the button between the 1st and 2nd dc on the end of the strap.